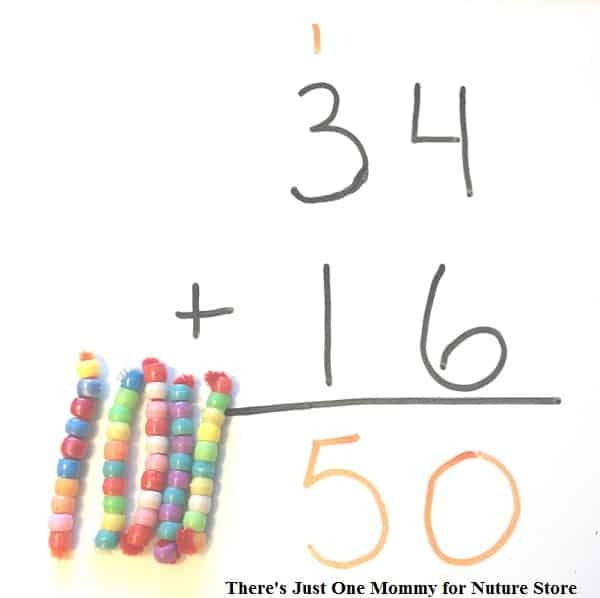 Christina from There’s Just One Mommy joins our ABCs and 123s series today with a hands-on, visual way to teach double digit addition. When learning how to add double digit numbers it can be difficult for some kids to understand why they must start solving the problem by adding the one’s column first. After all, we read from left to right; it seems natural to do math the same way. Using Base 10 Manipulatives gives them a visual of what is happening in the addition problem. It also helps them better understand why they must start in the one’s column. You can easily make your own Base 10 Manipulatives at home by following these simple directions for Homemade Base 10 Manipulatives. Use the dry-erase markers to write a double digit addition problem on your white board. Show your child how to use your Base 10 Manipulatives and extra pony beads to represent each double digit number in your addition problem. Explain that it is necessary to start by adding the one’s column. Add up the single pony beads together. If they add up to 10 or more, have your child use the extra pipe cleaner pieces and slide the pony beads onto it to create a new group of 10. This is a great visual to help them understand what is happening when we carry that one! Now have your child count the remaining single pony beads up and write that number in the one’s column of the answer. Count by 10’s to add up the number that should go in the 10’s place of the answer. Create several more problems for your child to solve in this method. 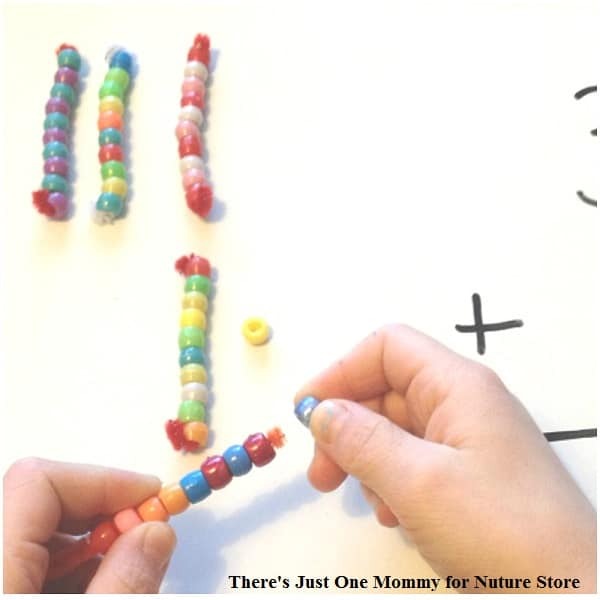 Sliding the beads onto the pipe cleaners not only gives them a great visual for the math problem, but it’s also fun and great for fine motor skills, too! 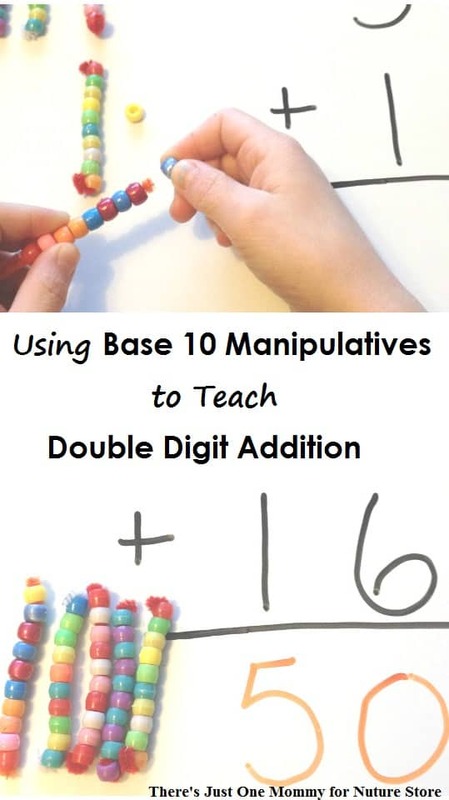 Use the Base 10 Manipulatives and loose pony beads to represent a double digit number and have your child figure out what the number is and write it down on the white board. 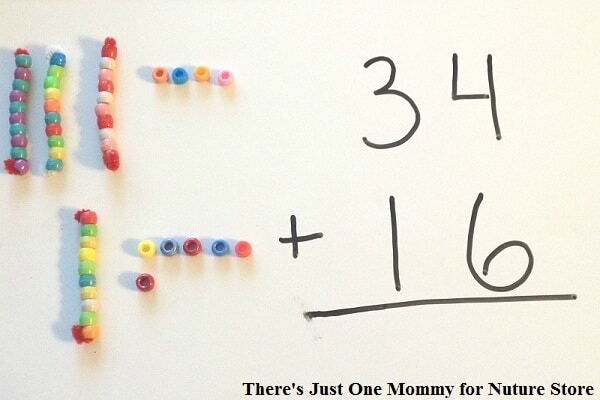 Let your child create a few addition problems for you to solve using the manipulatives. Being able to “be the teacher” not only gives them a sense of confidence, but also reinforces what they have learned. When your child is ready, use the manipulatives to teach double digit subtraction. Using Base 10 Manipulatives makes math more fun, and will help your child better understand what is happening in the problem. If you liked this hands-on math idea, you might want to check out our Subtraction Squish and Nerf Gun Math. Christina blogs at There’s Just One Mommy, where she shares her homeschooling adventures through crafts and learning activities you can easily do at home. Be sure to subscribe to her newsletter for more hands-on learning activities the kids will love. Such a clever idea. I have experience with Mortenson’s math but this is so much fun and easier for a child to want to do math!